Smooth, creamy, sweet and yet kinda like earthy green tea at the same time…matcha lends a unique taste to this chia pudding. Chia pudding is one of our favourite things to make for breakfast because it’s so easy to prepare in advance (even days in advance) and then just grab it and go in the morning. 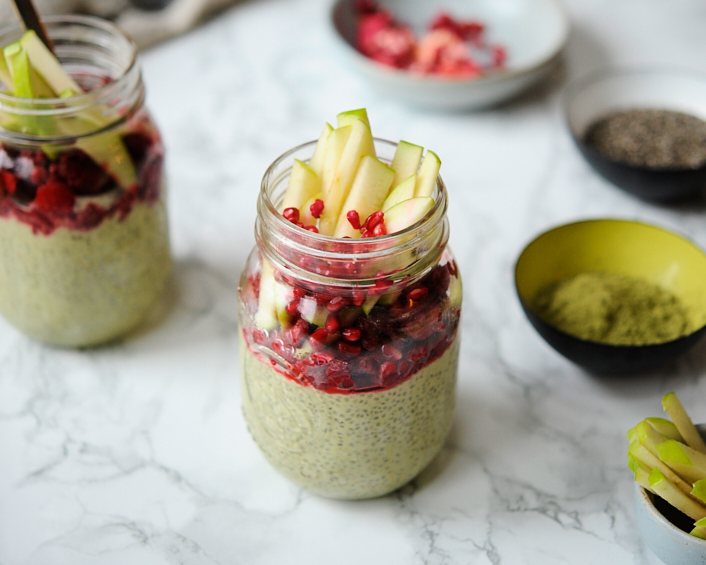 With this recipe, we even prepped all the fruit in advance and stored it in the same mason jar as the chia pudding. If you like green tea, then you’ll love this special matcha treat. And, since matcha is made from whole ground up green tea leaves it’s super rich in antioxidants. Chia seeds are wonderful to support digestion and keep things moving regularly, plus they also contain protein and anti inflammatory omega 3 fat. 1. The first thing you’ll need to do is whisk the matcha into the milk. Make sure there are no clumps. 2. Then whisk together all of the ingredients in a bowl. You can taste it and add more maple syrup if you’d like it to be sweeter. 3. Pour into 2 mason jars (or 3, if you want smaller servings). Cover and place the jars in the fridge over night. The pudding will be thick in the morning. 4. Top with berries, pomegranate and apple slices. To save time for another morning- add in the fruit in advance and seal up the jar, keep in the refrigerator.